If you’ve ever dreamed of experiencing Mardi Gras in New Orleans, you’re in the right place. In today’s post I’m going to share with you our experience of spending Mardi Gras in New Orleans, including tips on things you can do in New Orleans during Mardi Gras 2020, when Mardi Gras 2020 actually takes place, tips on finding accommodation during Mardi Gras, and more! This post is based on our experience of visiting New Orleans for Mardi Gras – a time when the whole city goes a little bit wild! This certainly had its upsides, as I’ve personally never experienced a US city hosting a huge carnival, so that was quite the experience. It also had its downsides, which I’ll go into a little later in the post. We spent about a week in New Orleans when we visited, and as well as watching various Mardi Gras parades and events, we did as much sight-seeing as we could. 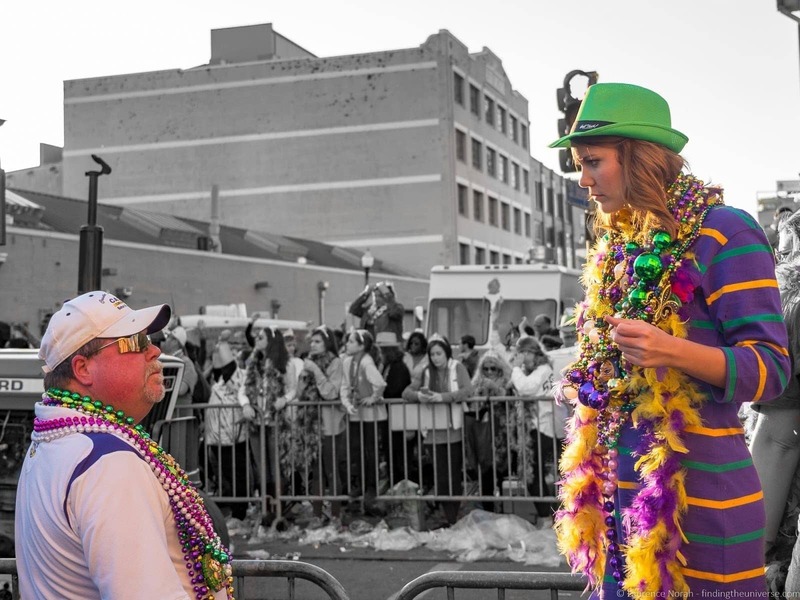 Before we get into all of that, lets answer some popular Mardi Gras questions you might have. 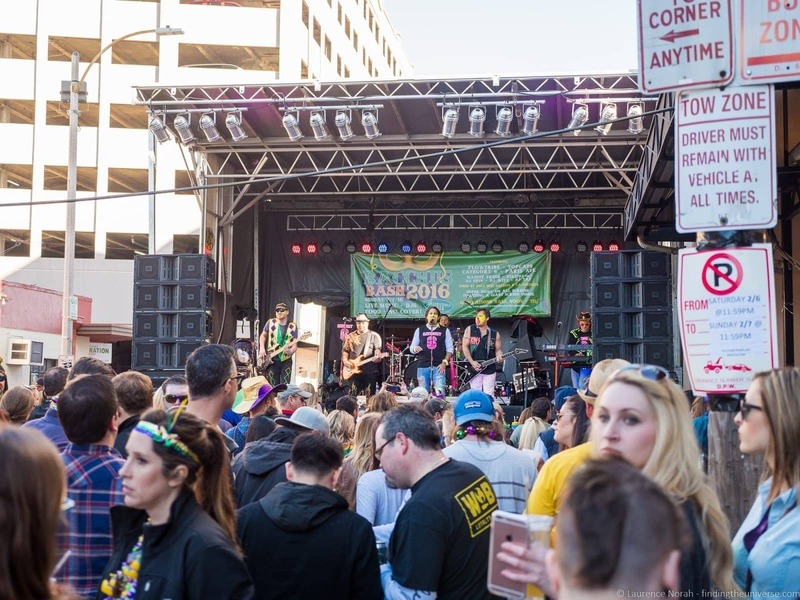 When is Mardi Gras 2020 in New Orleans? 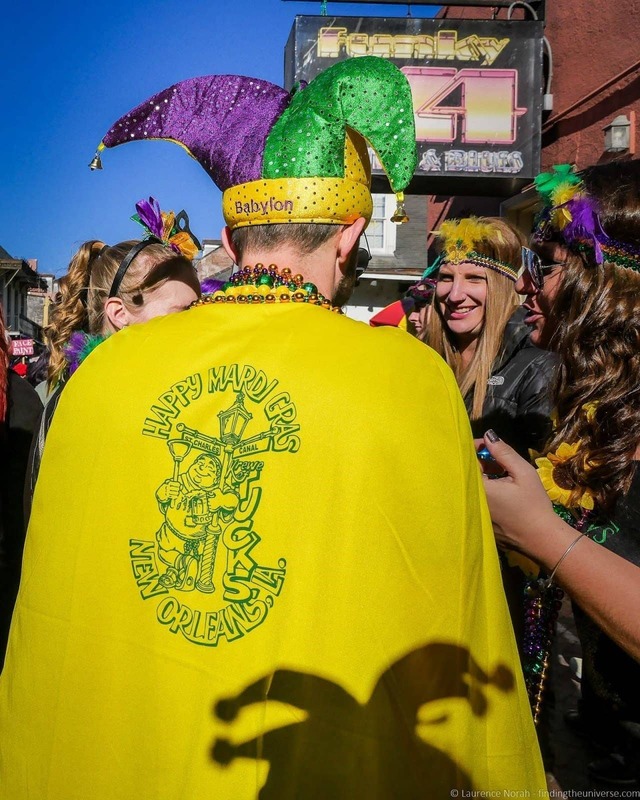 How Long Does Mardi Gras Last in New Orleans? Mardi Gras is a French term, which literally translates into “Fat Tuesday”. It’s based on a religious event, and falls on the Tuesday before Lent begins in the Christian Calendar, also known as Shrove Tuesday. The Wednesday is known as Ash Wednesday, which is the first day of fasting in the run up to Easter, 46 days later. In order to prepare for all those days of fasting, many people would traditionally eat a lot of fatty food in the run up to Lent, and particularly on the last day – hence “Fat Tuesday”. Obvious really. In many parts of the world, Mardi Gras has grown into a celebration in its own right, with carnival celebrations happening all over the world. Most famous of these is Mardi Gras in New Orleans, and the Rio Carnival in Rio de Janeiro, Brazil, where hundreds of thousands of people descend on the cities in question to have a good time and take part in the festivities. The US custom of celebrating Mardi Gras started in Mobile, Alabama in 1703 by a Frenchman. 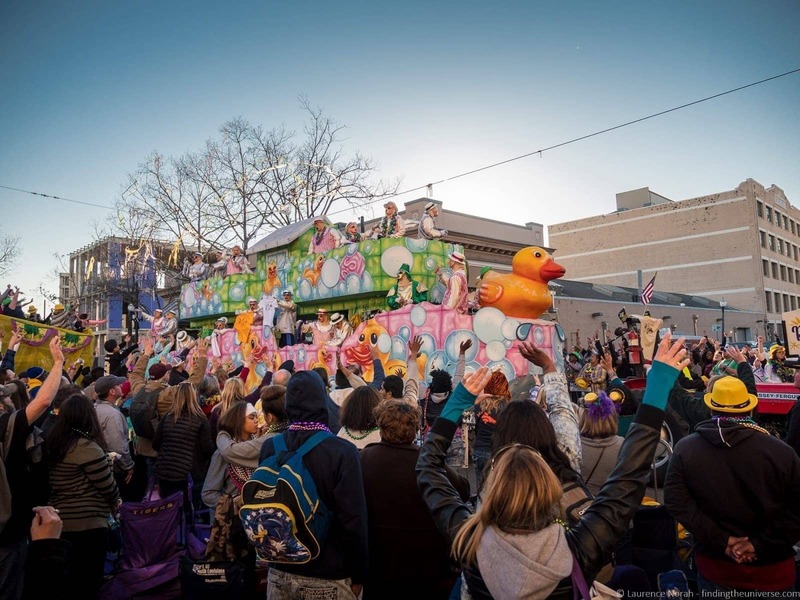 Mobile still holds Mardi Gras celebrations throughout the year (and has an excellent Mardi Gras museum), but New Orleans has definitely eclipsed Mobile as the US capital of Mardi Gras now. 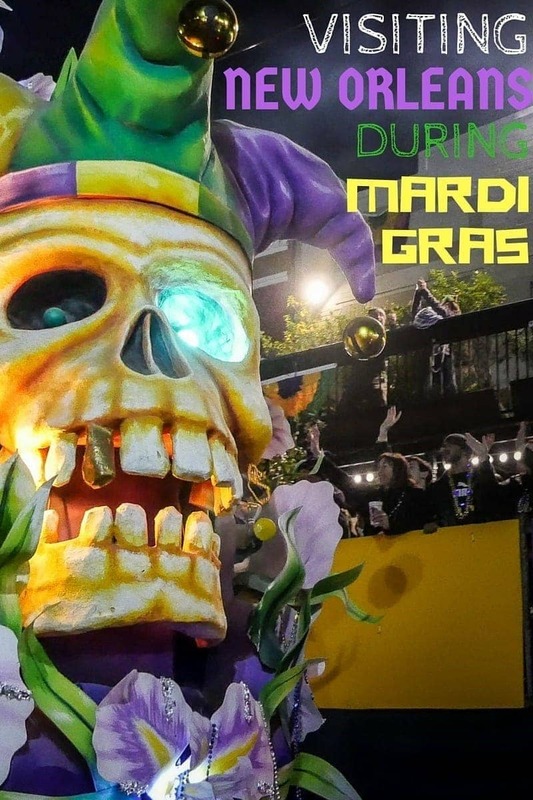 Mardi Gras 2020 is on the 25th Feburary, with the main celebrations happening in the two weeks leading up to the date itself. The largest celebrations usually happens on the two weekends before Mardi Gras itself, which always falls on a Tuesday. As mentioned above, because Mardi Gras is linked to a religious date, which is in turn linked to cycles of the Moon, the date changes every year. There’s also a tradition of celebrating on the Monday, which has come to be known as Lundi Gras. 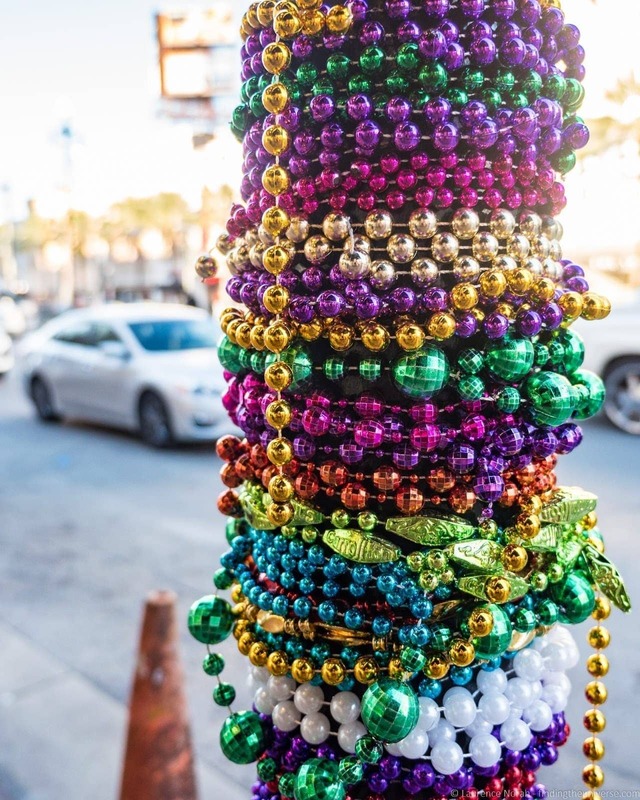 If you are planning on visiting New Orleans specifically for Mardi Gras, we’d suggest coming for the six days leading up to Mardi Gras to give yourself plenty of time for sight-seeing as well as parade watching. Officially, Mardi Gras starts on the 6th of January, and runs until Fat Tuesday. In New Orleans, the majority of Mardi Gras celebrations are held in the two weeks leading up to Fat Tuesday itself. 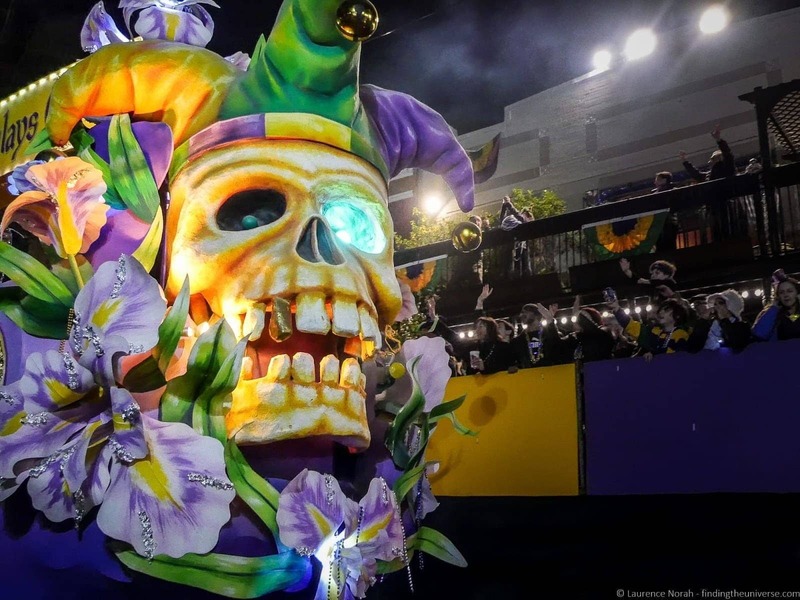 The biggest parades tend to happen over the weekend before Fat Tuesday, and on Fat Tuesday itself, so if you don’t have a lot of time, we’d suggest that would be the best time to go. Despite New Orleans being focused almost entirely on Mardi Gras, we found it was still possible to do a lot of sight-seeing in the city and surrounds. Just be aware many of the downtown roads are closed off for the parades at various times throughout the week or so leading up the event so driving and parking can be very challenging. It’s just worth bearing in mind, In New Orleans anyway, that the day of Mardi Gras itself is a holiday, so not everything will be open. Although we’d advise putting that day aside to enjoy the festivities anyway! 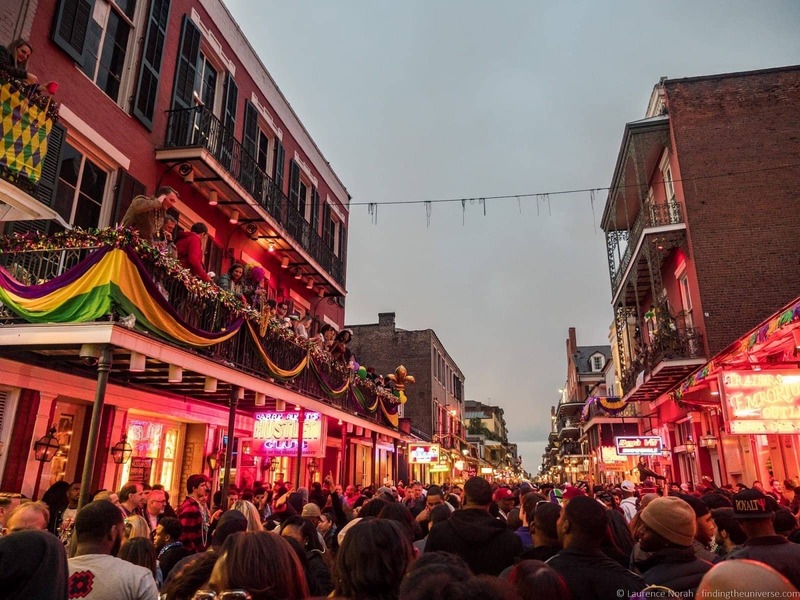 Here’s everything we got up to in New Orleans, to give you some ideas of what is possible in New Orleans during Mardi Gras. 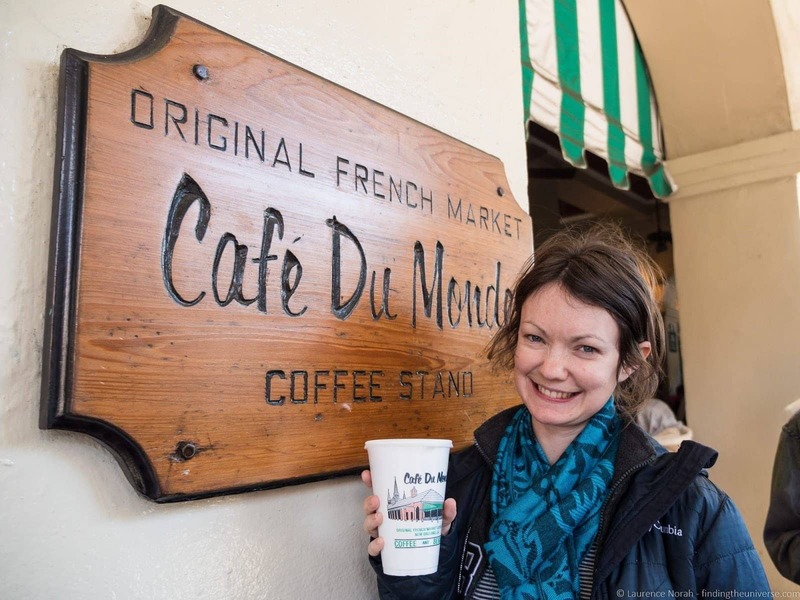 Easily the most famous Cafe in New Orleans, Cafe du Monde is known for it’s beignets (a type of doughnut) and chicory blended coffee (this can be a bit of an acquired taste!). It’s famous for people watching and is incredibly popular, which means you’re likely going to be queuing. Whenever we wandered by, regardless of time of day or night, it always seemed busy (it’s open 24 hours a day!). If you just want to try the famous coffee and beignets, you can queue for the takeout line which is often quicker than waiting for a table. Just near Cafe du Monde is Jackson Square, a historic park which sits in the French Quarter. The French Quarter is generally regarded as one of the prettiest parts of New Orleans, home to all those lovely houses with balconies which are so representative of New Orleans. 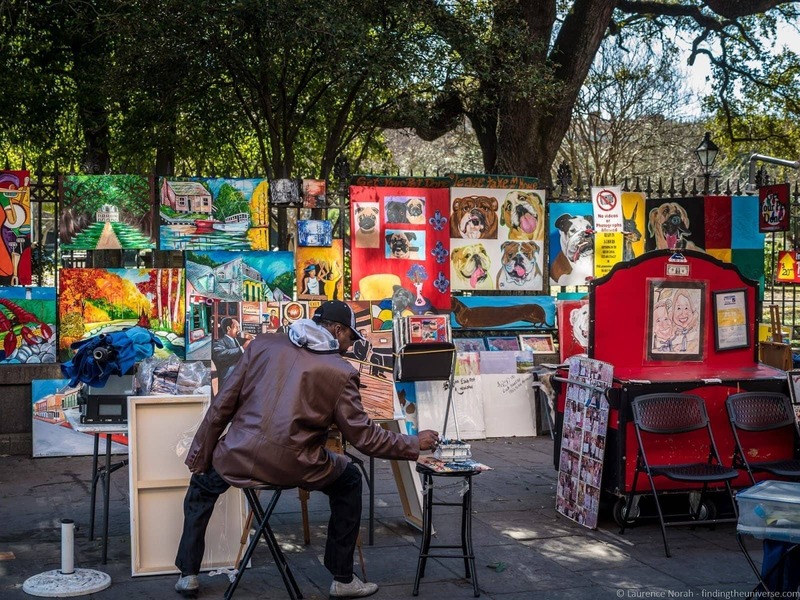 Jackson Square has been at the centre of public life in New Orleans for hundreds of years, and is still frequented by painters, musicians, and street performers of all ilk. 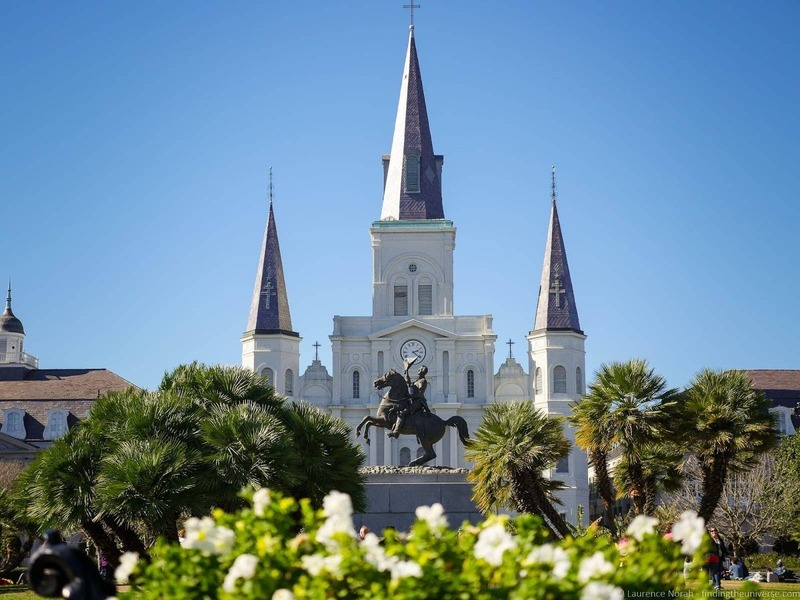 It’s historically important too – it was in Jackson Square that the French handed over New Orleans as part of the Louisiana purchase in 1803 – a historic land sale that saw the US pretty much double in size overnight. The centre of the Square is a lovely park, whilst the square itself is surrounded on three sides by historic buildings, including the Cabildo – the original Spanish City Hall. 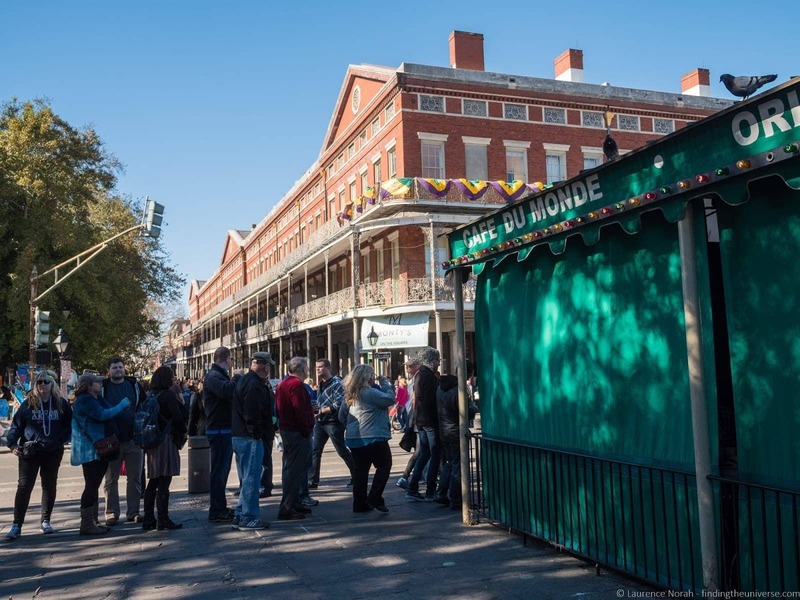 There’s definitely a lot to see here, and we loved wandering around, people watching, sipping on our Cafe Du Monde coffee, and taking in the street performers! So I already mentioned Beignets. The reason we didn’t eat Beignets at Cafe Du Monde was that we were saving ourselves for the Beignets at Cafe Beignet. The theory being that if a place has named itself after it’s main food offering, it should be a reliable place to eat them. This turned out to be a good bet. 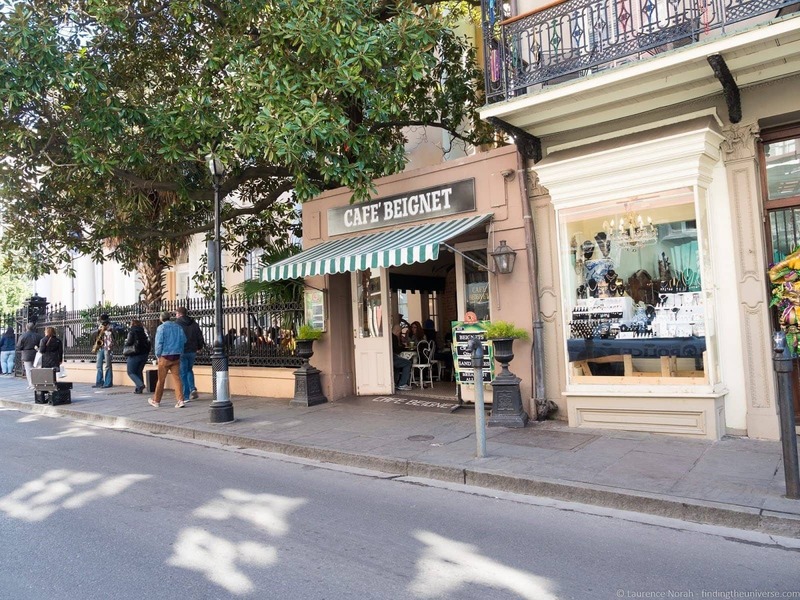 The breakfast at Cafe Beignet was absolutely magnificent, and there were plenty of options to choose from as well as those delicious, powered sugar covered Beignets. 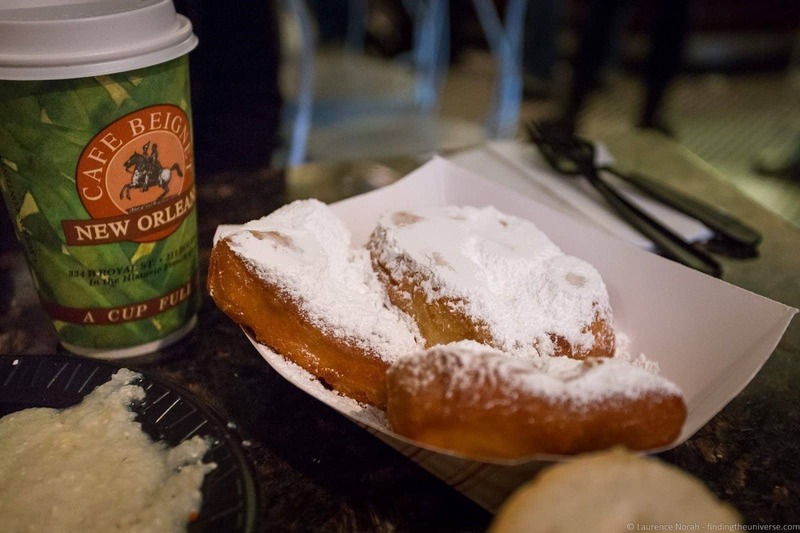 If you’re in New Orleans, you need to eat Beignets, and this is a great place to do just that. Mardi Gras is an essential part of life in New Orleans, and the best way to learn about it in the city is at Mardi Gras World. 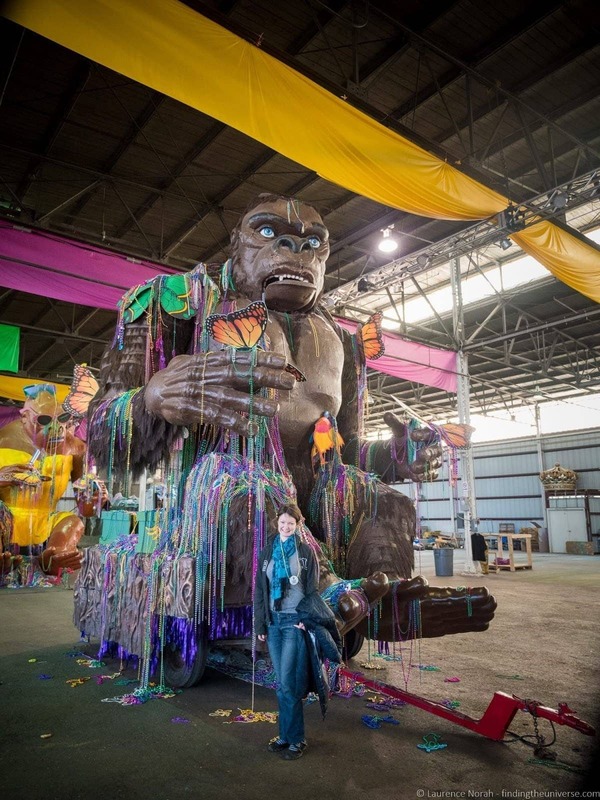 Operated by Blaine Kern studios, this is a living workshop where the massive floats that make up Mardi Gras are created, and many of them are also stored. Although, as we learnt, the company has a total of 16 warehouses around the city to store all the Mardi Gras paraphernalia, which should go some way to giving you some idea of the scale of this event! 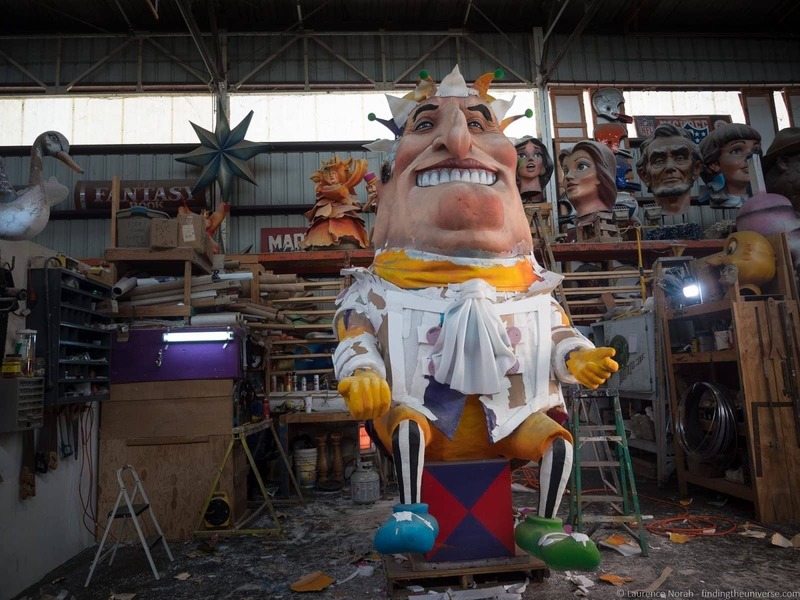 Mardi Gras World is a fascinating place to visit, where you can see new floats coming to life, and learn all about the traditions and customs of Mardi Gras via a guided tour that includes a video and some King Cake. We learnt a lot, including the fact that everyone who rides on the Mardi Gras floats has to pretty much purchase all their own throws (the beads etc. 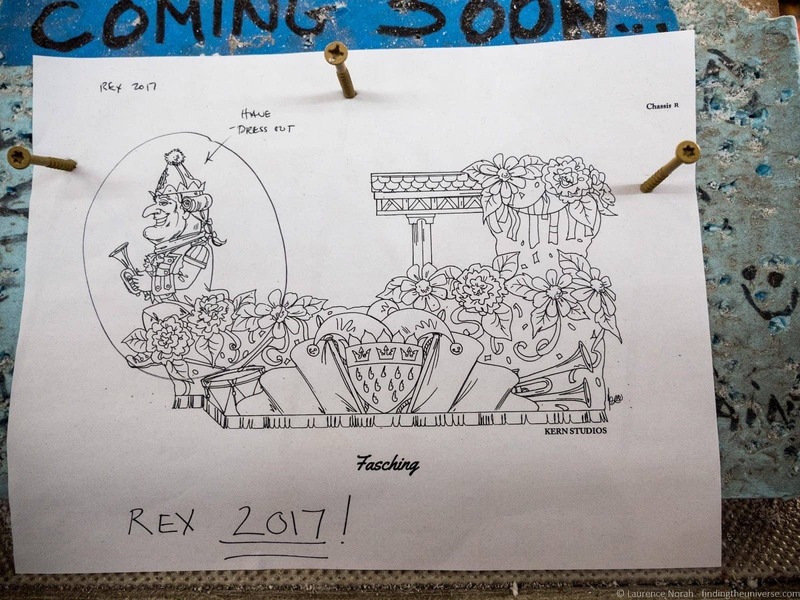 that are liberally distributed from the floats to the crowds), and that floats can cost upwards of $50,000 to create! The one downside of visiting Mardi Gras World during Mardi Gras itself is that many of the floats won’t actually be in the warehouse – they’ll be out either parading, or being prepared to parade. When we visited, the majority of floats were out. This wasn’t a problem though, as we saw them in their full glory on the streets of New Orleans, and were still able to appreciate the workshops, as well as some sneak peeks of the following years designs. If you’re in New Orleans and want to learn a bit about Mardi Gras, we definitely recommend heading to Mardi Gras World. Note, Mardi Gras world is about a mile or so from Canal Street, but there’s a free shuttle service. Just call the Mardi Gras World shuttle service (number on their website), and they’ll come pick you up. Ok, so this one is a bit weird, but hey, that’s New Orleans. 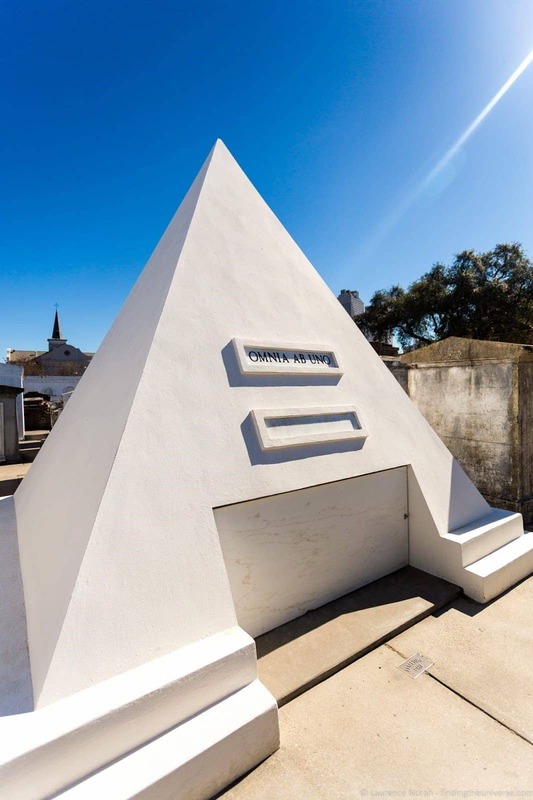 One of the top tourist attractions in the city of New Orleans are the cemeteries. Well, the answer is that New Orleans is built on a swamp. This makes the traditional practice of burying people in the ground a bit tricky, as all that decomposing body stuff isn’t really something you want leaking into your groundwater. The cities solution? Above ground graves. These graves are like little houses of their own, into which citizens are placed on their death. Usually, a grave will hold multiple bodies, and the heat means they actually work a little like ovens, accelerating the decomposition process, and meaning more space for the dead in each individual grave. 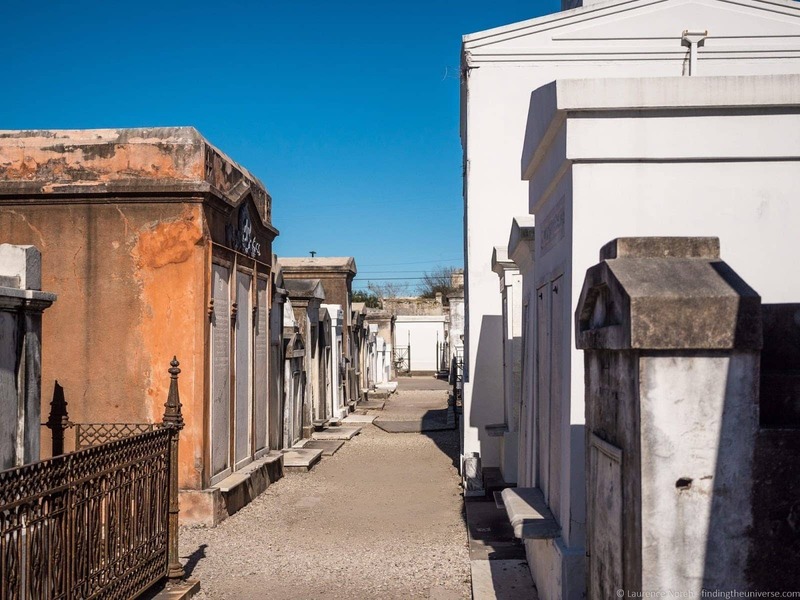 It’s a bit ghoulish, but it is unique to New Orleans, so a tour is an essential part of any visit. We did a 2 hour walking tour of St Louis Cemetery #1, most famous of all the New Orleans cemeteries. A similar tour is available here, and there’s a shorter 1 hour tour here. 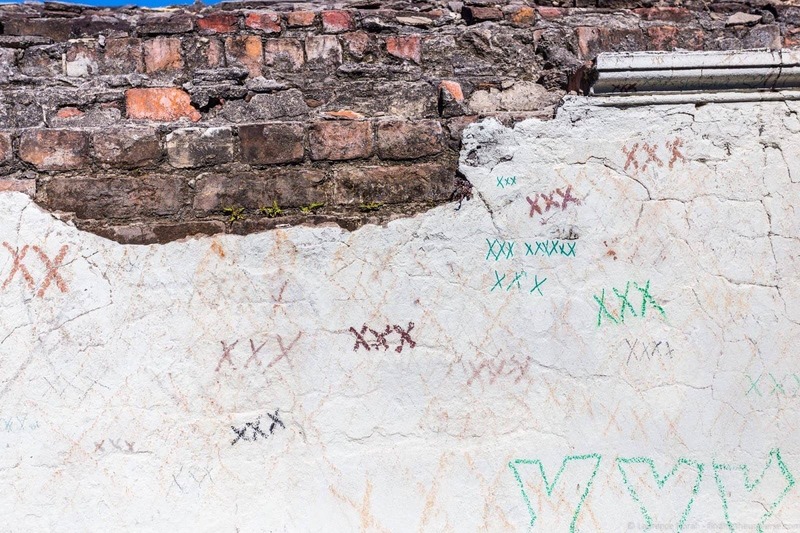 The tour covered both the cemeteries, and also touched on some of the Voodoo culture of New Orleans – with infamous Voodoo Queen of New Orleans Marie Laveau buried in the cemetery we visited. The tour was a lot of fun, and we learnt a great deal about burial in New Orleans. We also visited some notable graves, including that of actor Nicolas Cage (not dead at time of writing, but clearly a man who likes to plan ahead! 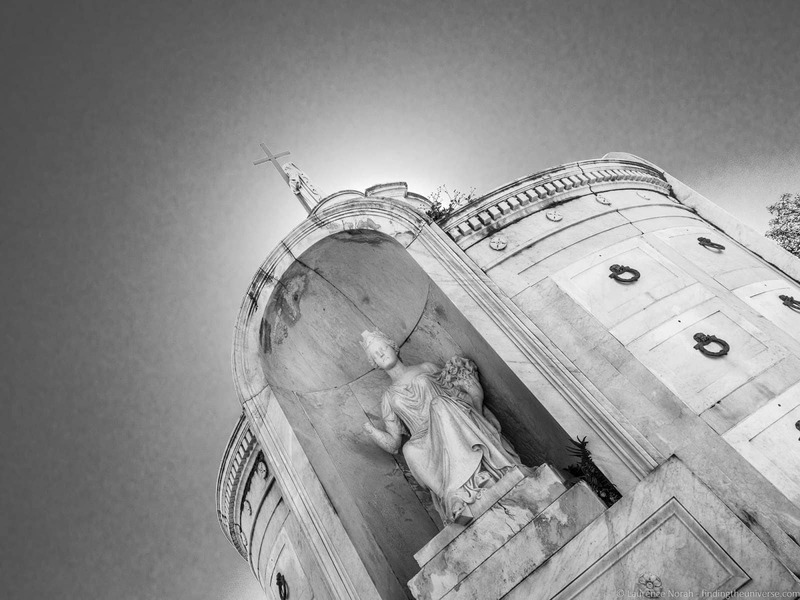 ), civil rights activity Homer Plessy, and of course, Marie Laveau. Note – in order to visit the St Louis Cemetery #1 you have to be on a tour with a guide who is specifically licensed to visit the cemeteries. We saw people being turned away who had unlicensed guides, so the policy is quite strict – we definitely recommend going with an official tour company like this. 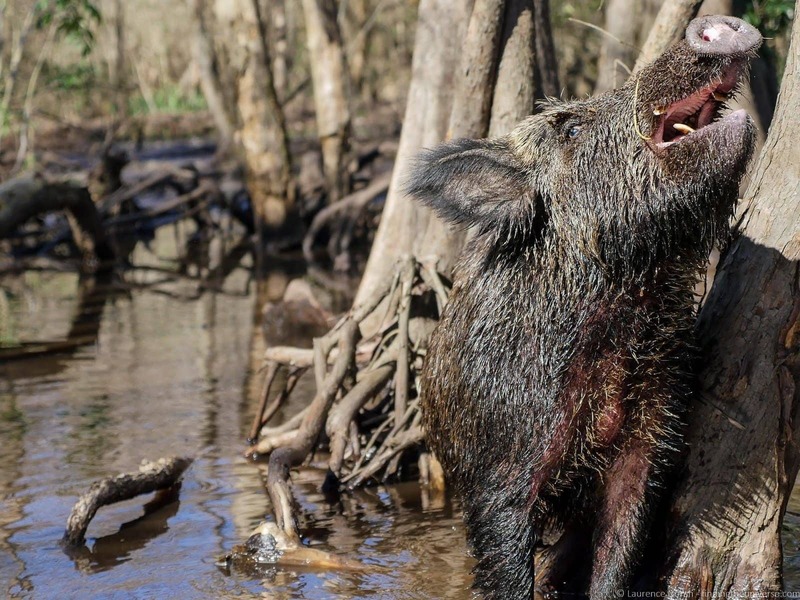 Speaking of swamps, another popular activity in New Orleans is to take a Swamp Tour, so naturally we signed up to do this, taking a Swamp Tour with Cajun Encounters. This did involve a bit of a drive out of the city. 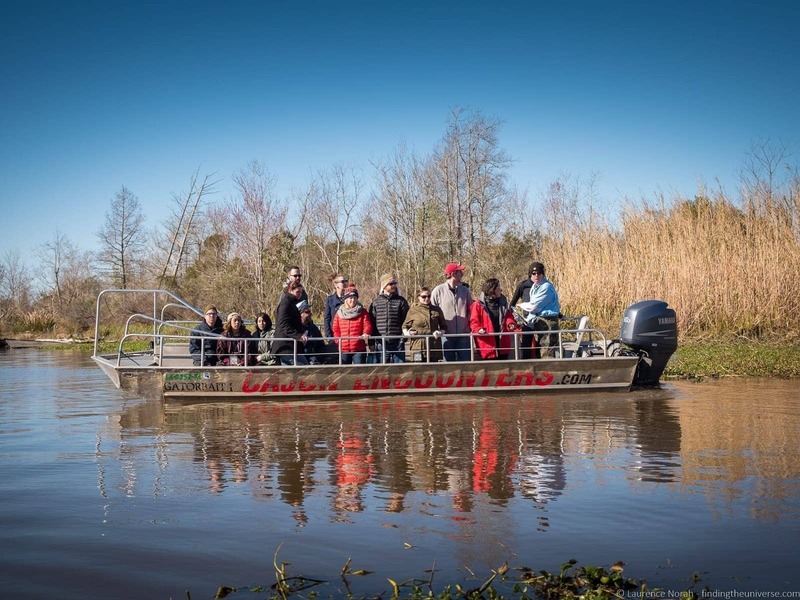 Cajun Encounters offers a tour with pickup, or you can drive yourself out and save a bit of money. There’s no public transport to the swamp that we could figure out. 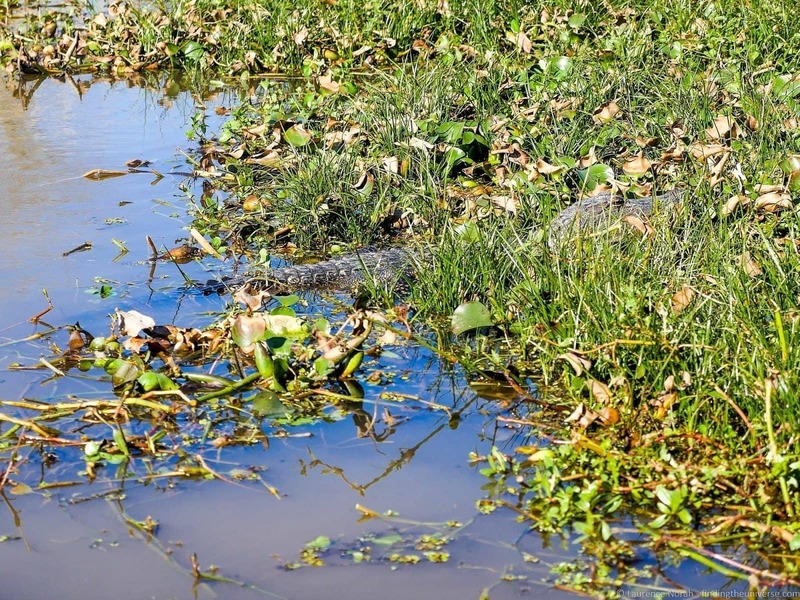 The swamp tour was a lot of fun, although as we were visiting in February, it wasn’t the ideal temperature to see the main attraction, which are the alligators, as they were mostly buried in mud waiting for the temperatures to improve. We did see a baby alligator though, which was pretty cool, as well as some other Florida wildlife including a racoon and wild pigs. Back in New Orleans, one of the more famous streets in the French Quarter is Bourbon Street, so naturally we had to explore this. This is where one of the Mardi Gras myths has to be dispelled. 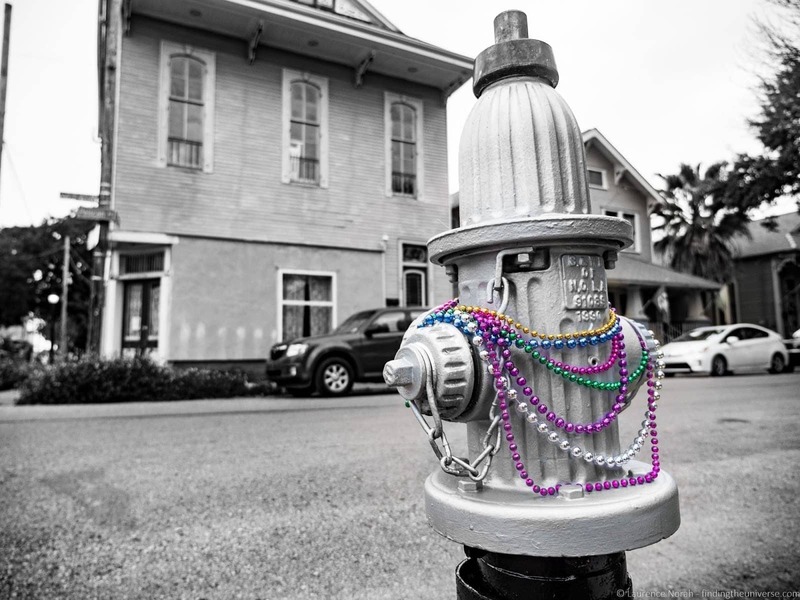 Prior to visiting Mardi Gras, I wasn’t entirely sure what to expect, but I imagined a fairly adult environment, with beads being bargained for clothes and revellers all over town. The reality was a little different. The main parades are a family friendly environment throughout the day and into the night (although there was plenty of liquor being consumed! ), and there are more than enough beads coming off the floats that you don’t need to give up your clothing for them. 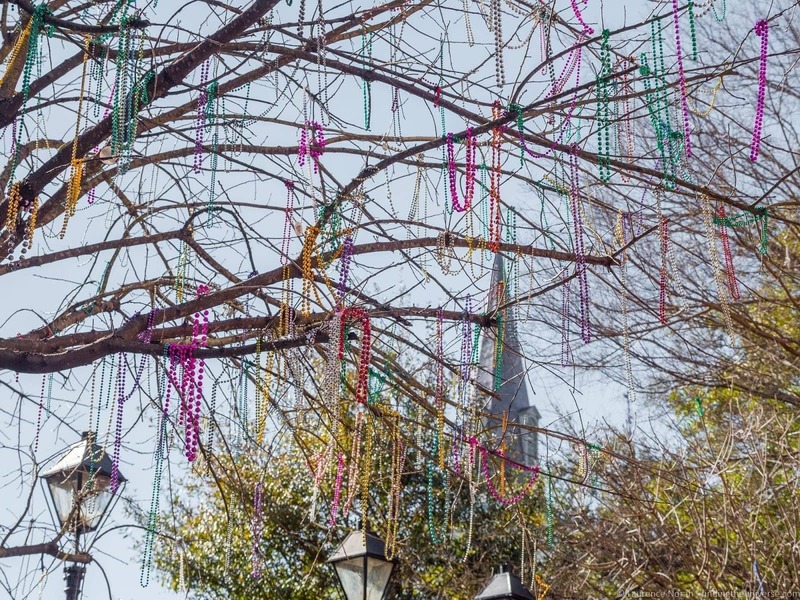 Mardi Gras is also held relatively early in the year, and despite what you might think about Louisiana, it can get pretty cold here in February. Most people therefore are wrapped up fairly warm, even if the sun is out. If you are looking for a more raucous Mardi Gras experience though, Bourbon Street is a good place to start. In the old days of Mardi Gras, the main parades used to run through the French Quarter, but this has become impractical due to fire and safety regulations. That’s not to say there are no Mardi Gras celebrations in the French Quarter though! Bars are stuffed full of patrons knocking back exotic looking drinks, and folks throw beads down from the balconies which line the streets. People wear all kind of fun outfits, some of which are definitely skimpier than others. And there are still floats, but they’re being pushed by people rather than drawn by tractors. The epicentre of the French Quarter Mardi Gras celebrations is Bourbon Street, which is definitely a very pretty street in the French Quarter, and worth exploring anyway, even when it isn’t jam packed with people who have beads raining down on their heads. But it’s also here where you can get a more adult oriented Mardi Gras experience, complete with street partying throughout the night. At least, until midnight on Mardi Gras Tuesday itself, when the party ends! 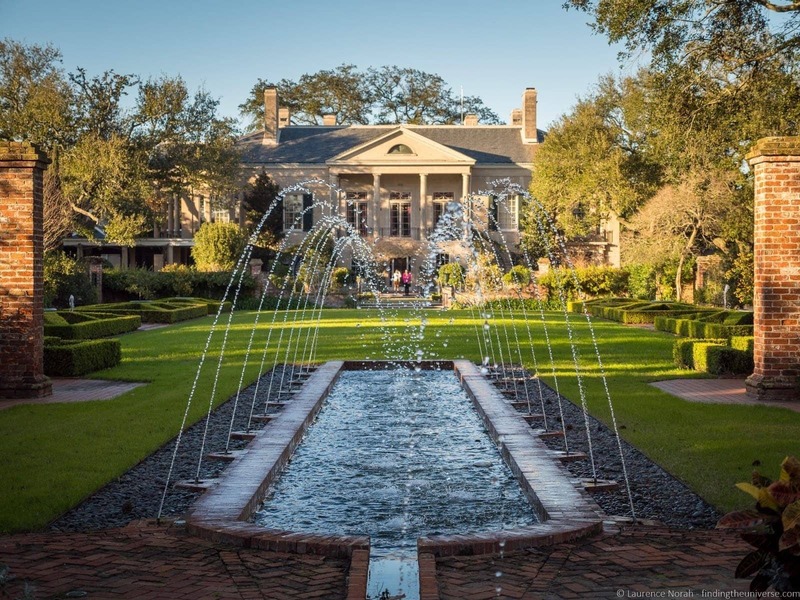 If you’re looking for something a little different to do in New Orleans, and love historic properties as much as Jess does, then a visit to Longue Vue House and Gardens should definitely be near the top of your list. This is a really interesting house to visit, largely because it was built to the vision of one couple, who had the whole house designed around their specific requirements. Philanthropists Edith and Edgar Stern had the home built in 1939 to replace their previous home in the same location, which no longer met their needs. Open now for guided tours, the home features three beautiful floors and a variety of features that would have been ground breaking in the day. The gardens are also well worth exploring, and it’s a nice break from the city centre madness of New Orleans during Mardi Gras! Getting here from the city centre is a little tricky. We ended up taking public transport, which gave us the opportunity to take the lovely old New Orleans tram, but did also require a twenty minute walk to the house from the tram stop. If that’s too much, grab an Uber, or take a look at the options on the Longue Vue house website for additional transport ideas, as well as opening information and pricing. 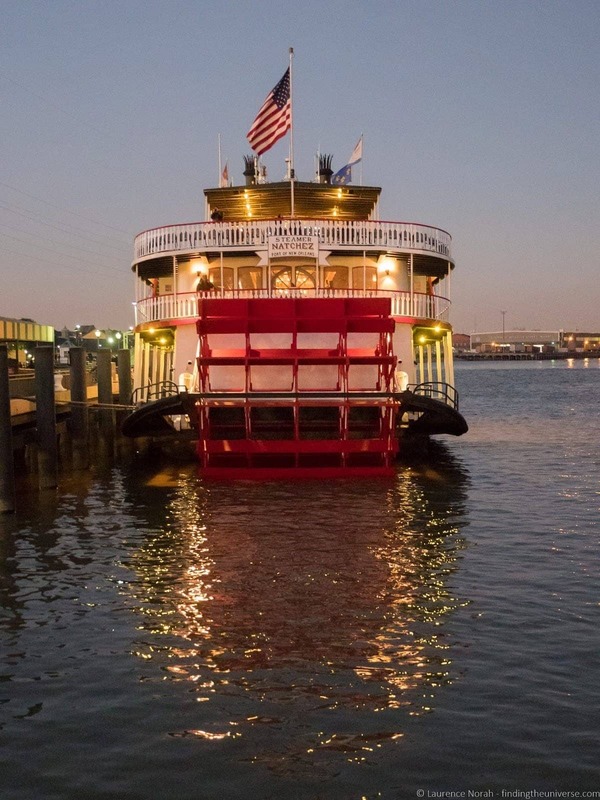 Our last night in New Orleans was pretty special, as we took a Steamboat Cruise on the mighty Mississippi River, aboard the Steamboat Natchez – the only steam powered river cruise operating out of New Orleans, and one of only two steam powered sternwheel boats on the entire Mississippi River. This was a wonderful way to spend a couple of hours, as the boat cruised down the river, and we enjoyed live jazz and a full three course meal, accompanied by drinks. 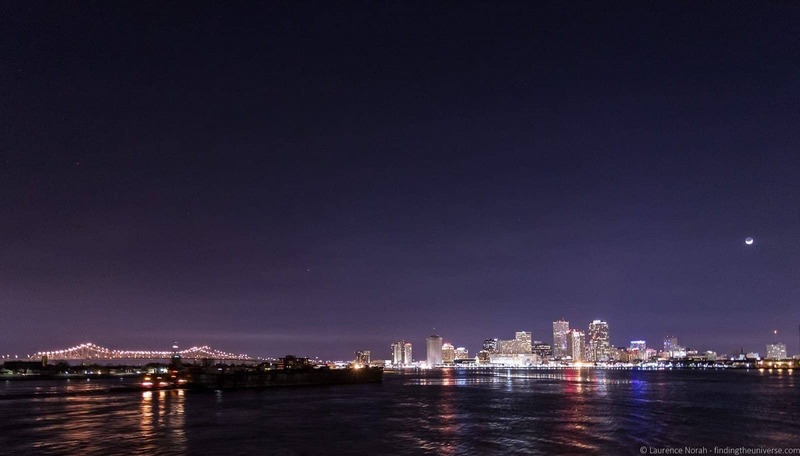 The views from the river of the city by night were quite special, and it was a fantastic way to end our New Orleans adventure, and in fact, our whole Deep South Road Trip. Ok, onto serious topics. When you’re in New Orleans for Mardi Gras, you basically have to eat King Cake. This is a brioche style dough covered in sugar, with the twist being that there’s a figurine of a baby inside. The theory goes that whoever finds the baby in their slice of cake, has to throw the next party. 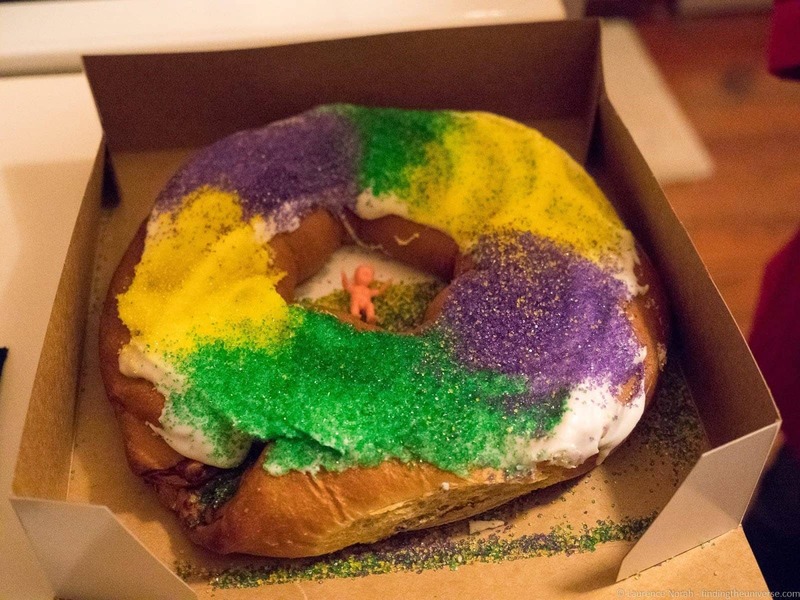 Whatever the obligations, King Cake is good, it’s colorful, and it’s definitely worth getting your hands on a slice when you’re in town. 11. Go To Mardi Gras! This one should be obvious – we went to New Orleans during Mardi Gras, so naturally we took in a few parades! 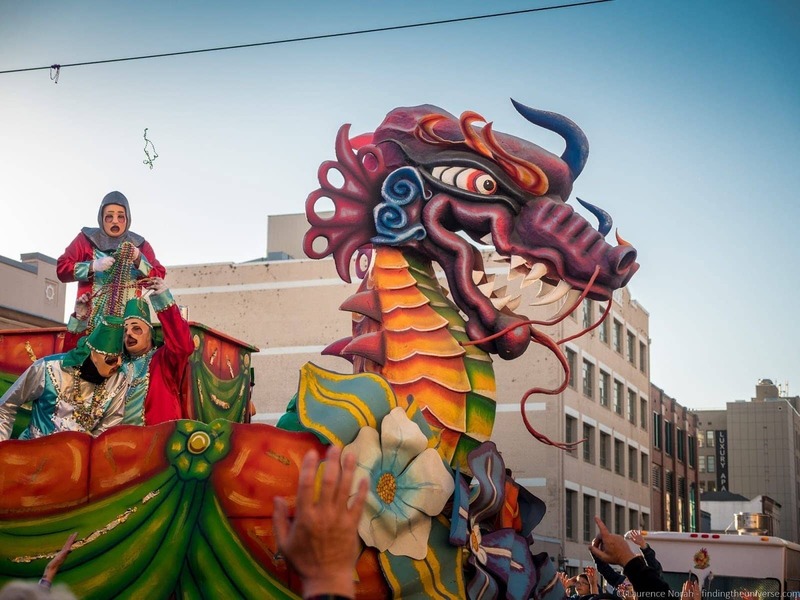 There are a great many parades that run in the weeks running up to Mardi Gras, winding their way on various routes through the city. Each parade is operated by a “Krewe”, and will be made up of a great many floats – up to forty five floats in a single Krewe in fact, with some of those being double floats. There are over thirty Krewe’s that parade through New Orleans during Mardi Gras, and seeing them all would like be quite the effort. So, aim for the highlights, with the Krewes of Rex, Endymion, Zulu and Bacchus being particularly noteworthy. 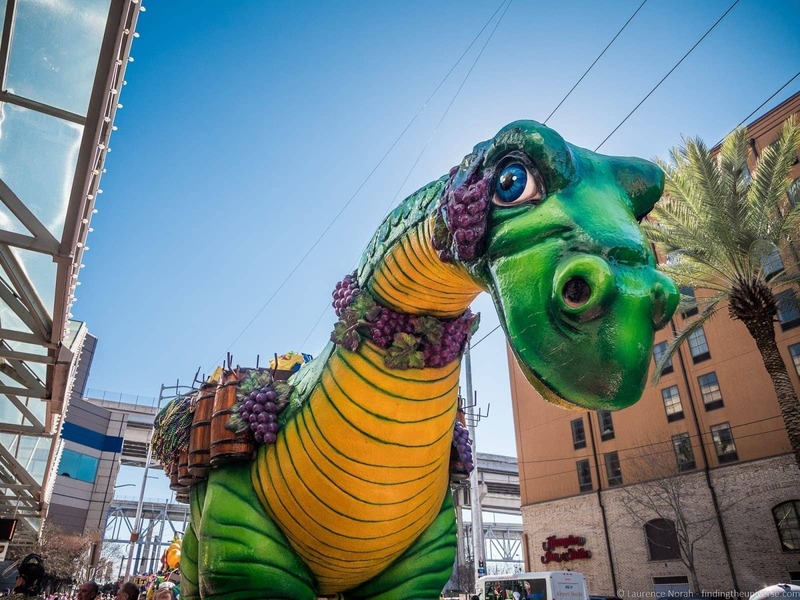 All the information on the parade times and routes can be found on the official New Orleans Mardi Gras website, plus you can download apps for your smartphone to get live updates on parade locations which is very useful when you’re standing and waiting for them to start rolling by! In terms of watching a parade, the routes are very long, and we found that the further from Canal Street we went, the better chances we had in terms of getting a good spot. 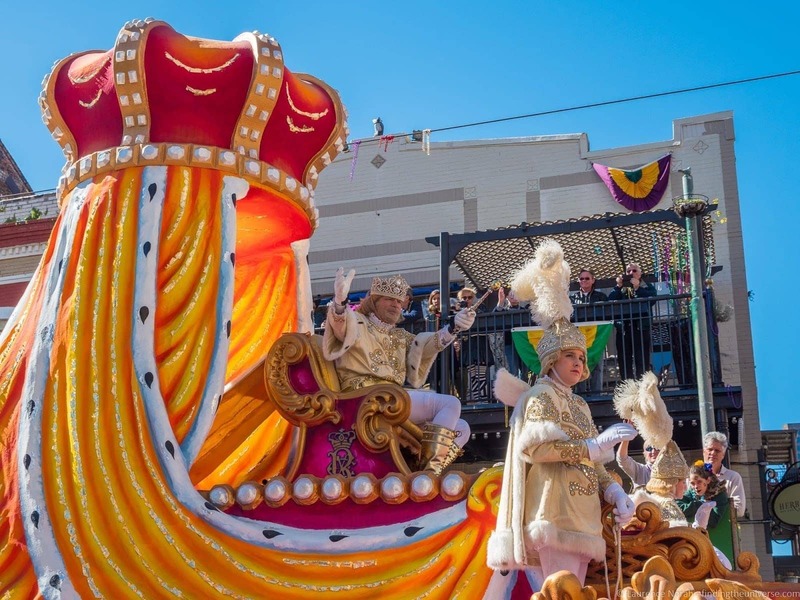 The most popular parades will be very busy, but if you just want to get some fun throws, head along to a middle of the day parade, and you’ll find yourself quickly weighed down by more beads than you’ll know what to do with! There are also a number of side events that occur throughout Mardi Gras. 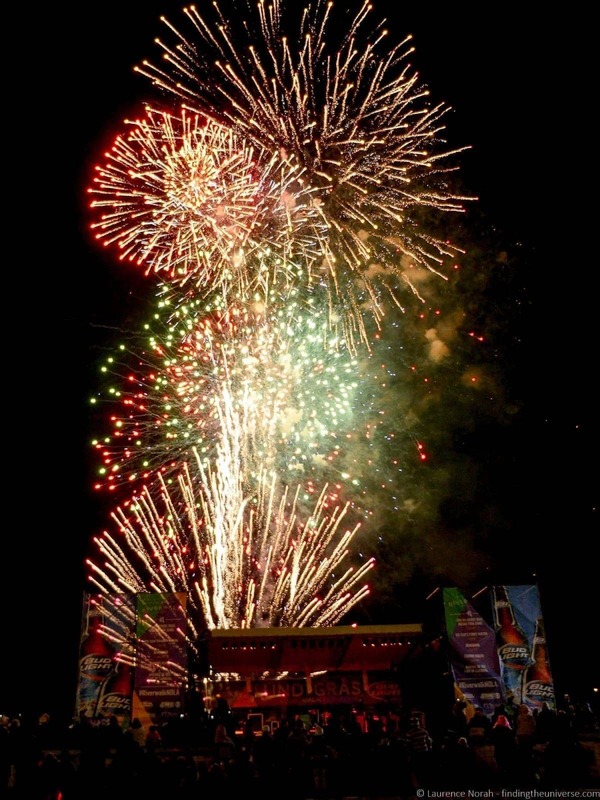 Two highlights for us were the Lundi Gras celebrations, which featured live music and evening fireworks, and the Bacchus Bash street party, which took place on the Sunday before Mardi Gras Tuesday, the same day as the Bacchus parade took place, and also featured live music throughout the day. 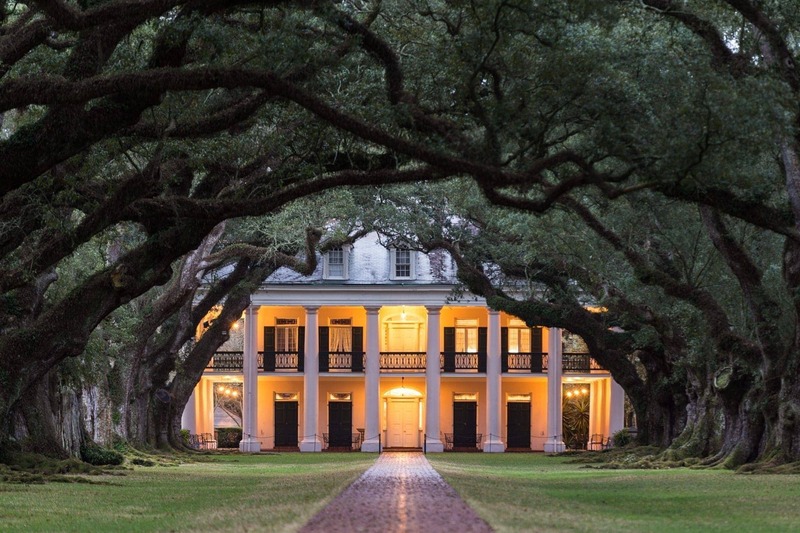 Between New Orleans and Baton Rouge is the famous river road, which is home to a number of beautiful plantation homes. Destrehan Plantation and Ormond Plantation are the closest plantations to New Orleans, although Oak Alley is one of the famous and visited of all the plantations. We visited 12 of the plantations along the River Road, staying overnight at Oak Alley, and put together a detailed guide to visiting the Louisiana Plantations. 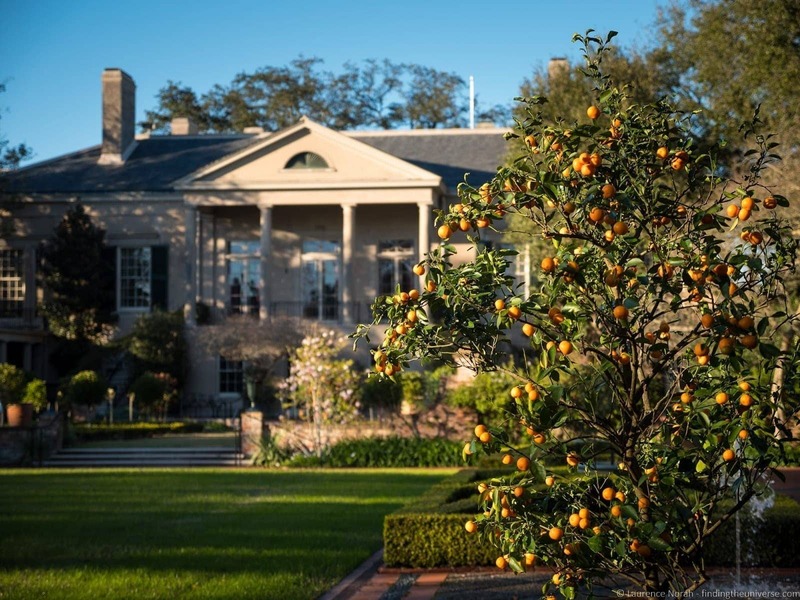 The plantations can all be visited as a day trip from New Orleans, either by car or by tour. 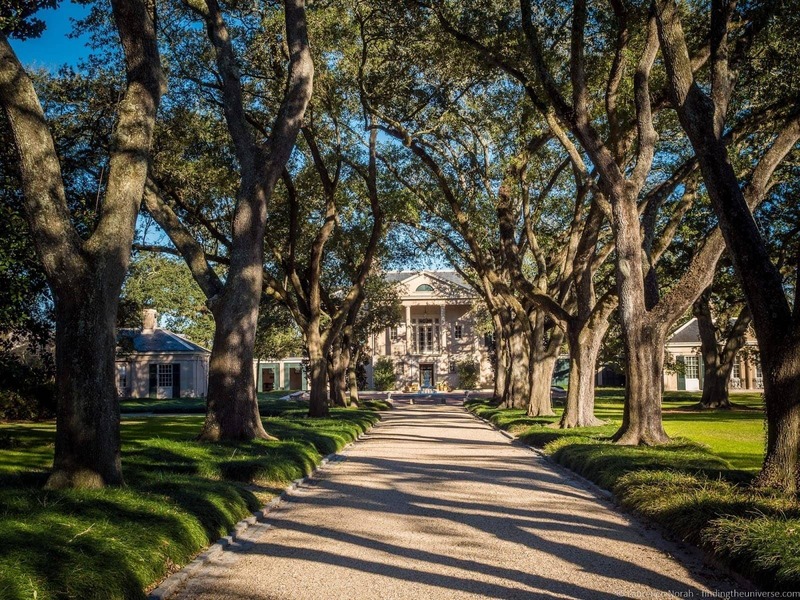 If you want to take a tour, we can recommend this day tour from New Orleans which gives you the option to visit 2 plantations of your choice from Oak Alley, Laura Plantation and Whitney Plantation. Alternatively, this guided tour visits both Laura Plantation and Oak Alley Plantation. There are lots of tours to choose from – we’d suggest you take a look at Viator’s tours as they offer lots of different day tours, both group tours and private tours from New Orleans. If you’re visiting New Orleans during Mardi Gras, you’ll have noticed that many things are quite expensive! One way to save money, if you plan on doing some sight-seeing, is to invest in a New Orleans Pass. This gets you into over 25 New Orleans attractions and tours, as well as some of the plantations on the river road, and swamp tours. Definitely a good way to save a bit of money during Mardi Gras if you think you’ll use it. Mardi Gras is a fantastic experience. People really get into the spirit, with awesome costumes in the crowd, and a real party atmosphere pervades the city. And that’s not even mentioning the floats, which are truly mobile works of art. You can also still see a lot in New Orleans, as we did. There are two main disadvantages to visiting New Orleans during Mardi Gras. First, it’s going to be super busy. If you’re not into large crowds of people, streets being closed off and all the things that go along with a city partying for a couple of weeks, this might not be for you. The other disadvantage is price, and in particular accommodation. A lot of people come to New Orleans for Mardi Gras, and this pushes accommodation prices through the roof. We paid around $1,000 for a weeks AirBnB accommodation during Mardi Gras, which was an incredible bargain – even if it was much higher than you would normally have to pay. I wouldn’t let these two things put you off experiencing Mardi Gras in New Orleans, or coming to New Orleans during Mardi Gras. Just be prepared for the experience! I’m not going to lie, finding accommodation in New Orleans during Mardi Gras can be a challenge. 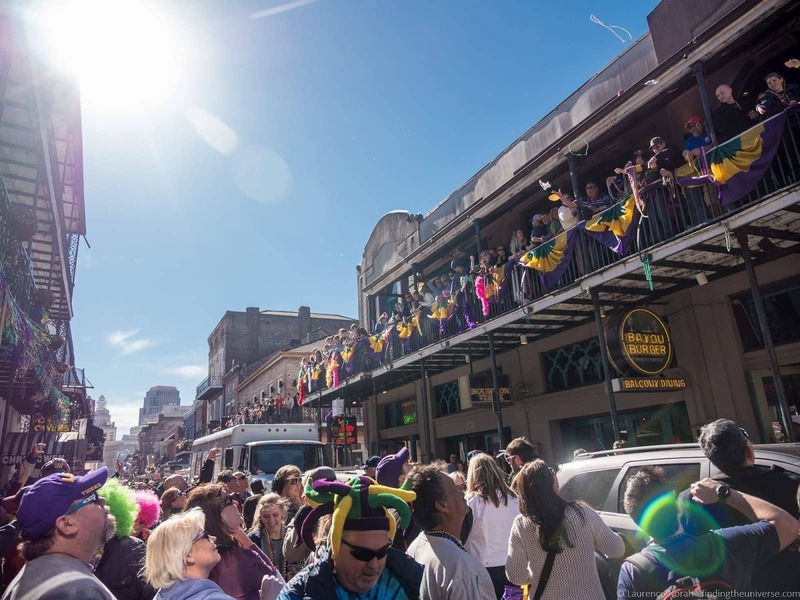 Mardi Gras is a seriously popular time of year to visit New Orleans, meaning prices are going to be high, and availability in New Orleans hotels will be low. On sites like AirBnB, you’ll see prices double or triple, and even then, there won’t be much availability. Your best option is to book as far in advance as possible, or be prepared to put up with properties that are a little distance from the center. We ended up staying in an AirBnB on the other side of the river, in the historic “Old Algiers” part of town. This was a ten minute ferry ride across the river into the heart of downtown, so not too much hassle, and was a very quiet neighbourhood, so we were able to escape the hustle of the main Mardi Gras parties when we wanted to. 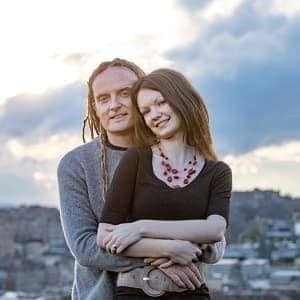 If you aren’t having much luck with AirBnB, I’ve compiled a series of AirBnB alternatives that you should take a look at to give you more options. 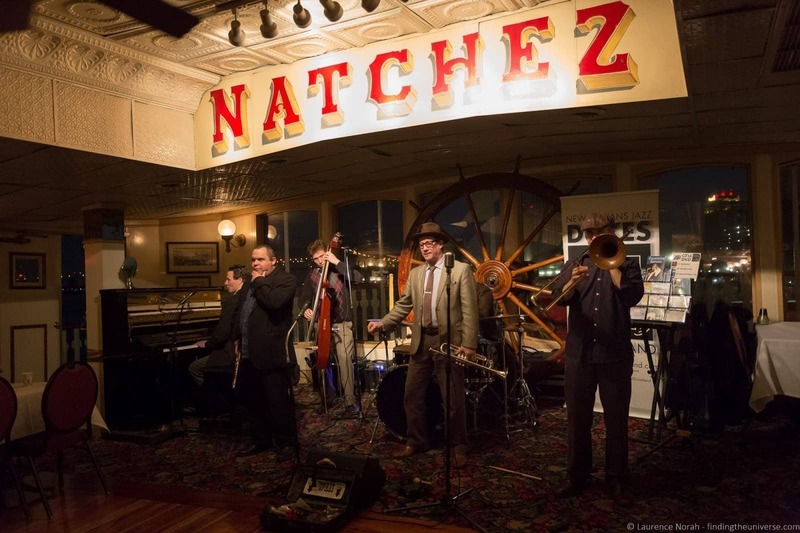 Otherwise, check the usual suspects for their New Orleans listings: booking.com being our preferred option for hotels and apartments. Book as soon as you find a reasonable deal as they sell out quickly, and good luck! We experienced Mardi Gras in New Orleans as part of a road trip through the Deep South of the USA. That adventure started in Charleston, South Carolina, and we went through four states, ultimately ending up in New Orleans for Mardi Gras. We’ve visited a lot of other cities in the USA! See our guides to things to do in Austin, things to do in Albuquerque, things to do in Cambria, things to do in Huntsville, and things to do in Santa Fe to get started! And that’s the end of this post on Visiting New Orleans During Mardi Gras! We hope you found it useful. As always, if you have any feedback or questions, let us know in the comments – and do feel free to share this post on social media if you found it useful! So you know, we had support from the New Orleans CVB for our trip, who covered our Swamp Tour, Cemetery Tour, Mardi Gras World entrance fee, Steamboat Cruise, Longue Vue House Entry and Cafe Beignet Brunch. All other expenses on the trip, including accommodation, other meals, car rental and public transport, we covered ourselves. For more information on who we choose to work with and our transparency policy, check out our code of ethics. Our pleasure D – thanks very much! Hope you enjoy Mardi Gras if you’re heading that way! Thank you Laurence Norah, the good things here for the readers is the the full guides and informations that you gives, because it very important before to go to place they want to go, that’s why this blog is awesome for me, this is a must read of every traveller this can helping them to budget and enjoy their vacation. I fell in love with New Orleans in 2016 – I can’t get enough now! And after visiting Mardi Gras World when I was there, I 100% need to get to Mardi Gras one of these years!! 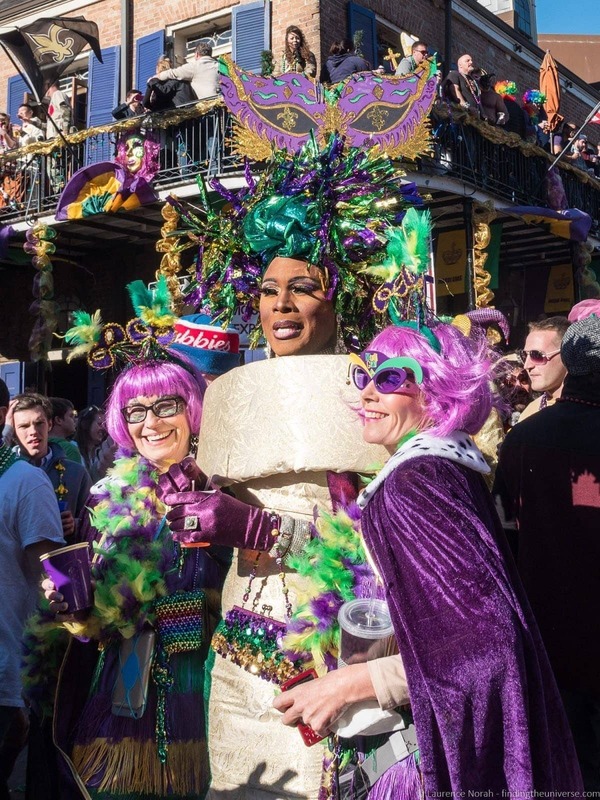 Excited to be heading to NOLA for Mardi Gras next month, so enjoyed learning more about the history and seeing your photos of what we can expect. Won’t be going too crazy on the party side of things as we’ll be with our young kids, but have taken note of those tips on places to eat and drink. And Mardi Gras World does sound very interesting, it’s on our list. Just make sure you eat lots of King cake and have at least one Hurricane cocktail 😉 Have an awesome time! I’m curious how much to expect by way of lodging. I imagine even on Airbnbs it’s probably upward of $300 a night! 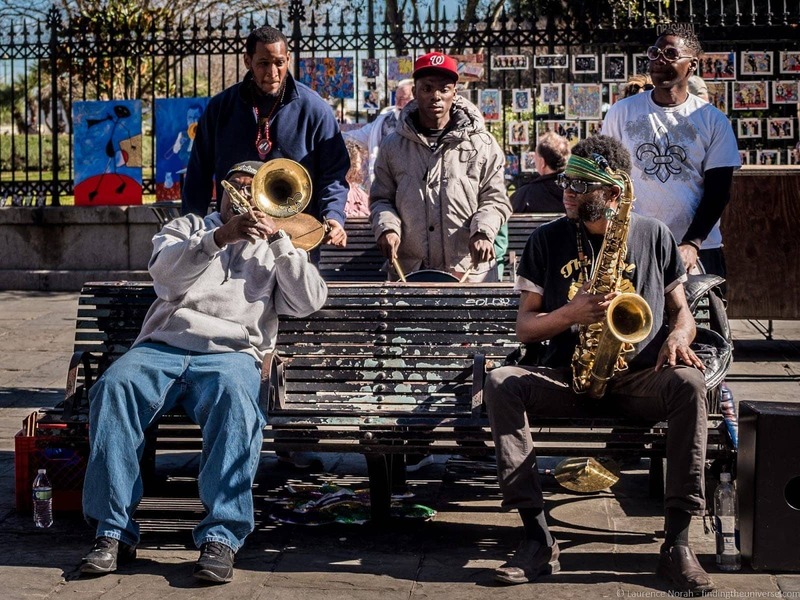 I do love New Orleans, though—I think I might want to visit during Jazz Fest even more than Mardi Gras. I was back there last summer with my girlfriends and ate so much I needed a week-long nap afterward! Mardi Gras in New Orleans is my absolute goal! I might go there for next new year, which is great as well, I hope I can do it! Mardi Gras in New Orleans is an amazing experience. The other best place to go during Mardi Gras has to be St. Louis. If you’ve never been you should see it. Glad to see New Orleans doing well post Katrina. Great post. Love the pictures!